There’s one phrase that will always make Ralph Nader upset. Every so often after a lecture or event, a member of the public will begin a conversation with him by using the phrase, “I’m not important but…” He will stop them right there before they go any further, disagreeing with the premise of the offending phrase because to Nader, every person has dignity, worth and the capacity to do extraordinary things. Especially in the United States there are societal mechanisms that allow individuals to harness their own intrinsic power to effect real change either through civic engagement or, as was the topic for the day, through the court system….through tort law. Tort law broadly defined is the law of wrongful injury and it is the “weapon of justice for the powerless”. When we have the right to a day in court with a jury of peers or at least an independent judge, justice can prevail even against the most powerful of forces. 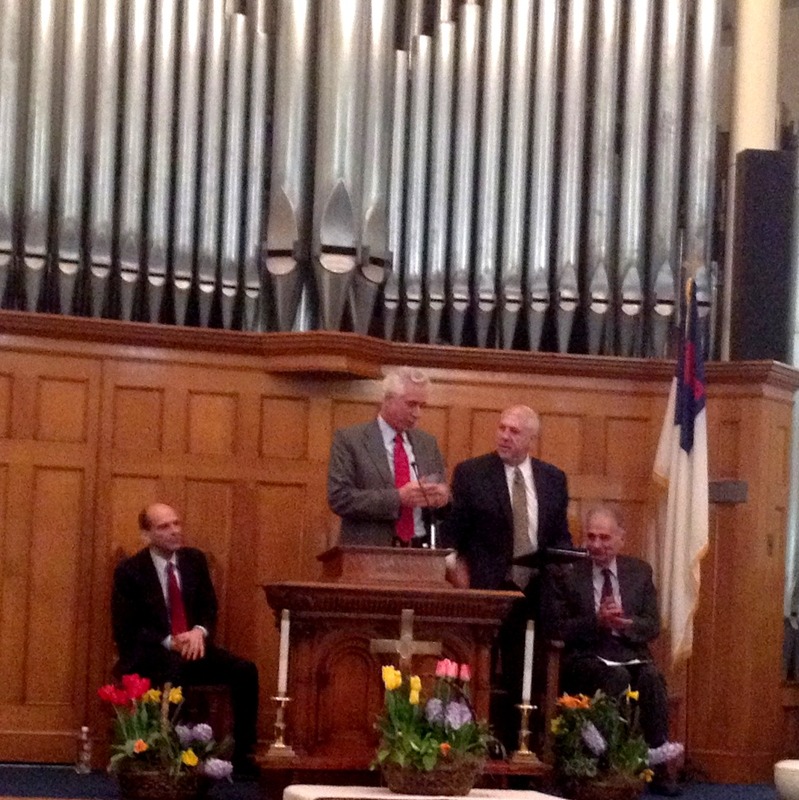 As the American Museum of Tort Law in Winsted, Connecticut held their grand spring re-awakening event on Saturday 4/2/2015, the Winsted United Methodist Church was filled to capacity to hear guest speakers Mitchell Garabedean, Jan Schlictmann and Ralph Nader. These three individuals have each undertaken legal battles of a seemingly Herculean nature against powerful entities and society has benefited from their work. Interestingly. movies have been made about all three lawyers and their fights to hold the powerful accountable. 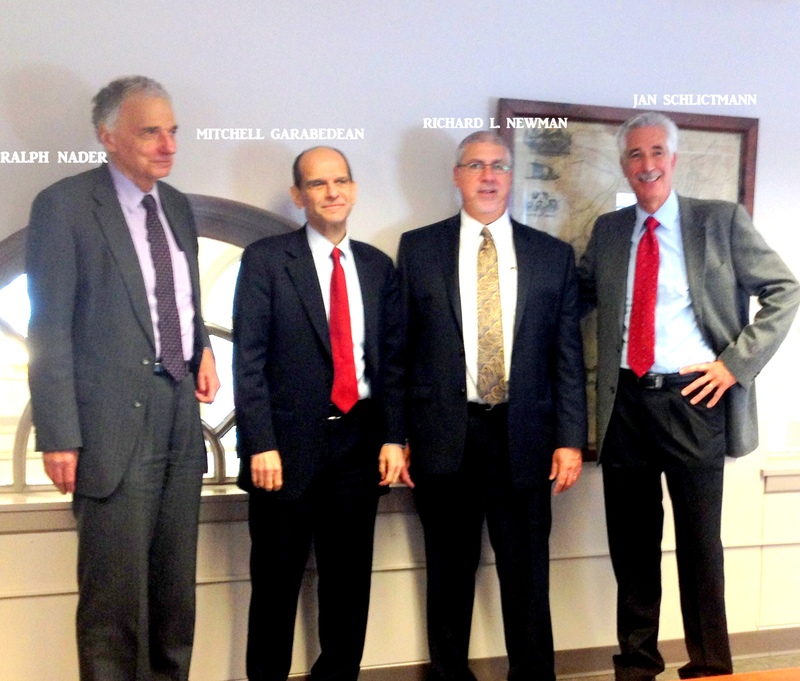 The master of ceremonies for the Museum’s “Reawakening event” was Richard L. Newman, the Executive Director of the American Museum of Tort Law. Newman is a Connecticut attorney whose prior legal work at the law firm of Adelman, Hirsh and Newman LLP made him uniquely suited for his present mission. A cadre of able volunteers under the direction of Sara Nowak, Assistant Director of the museum, welcomed visitors, checked the lists and ensured the festivities went smoothly. The first guest to speak was Mitchell Garabedean. Garabedean is the Massachusetts attorney who took on the Catholic Church abuse scandal, starting by representing the victims of Fr. Geoghan. He has been portrayed on film not once but twice, most recently by Stanley Tucci in the Academy Award winning film “Spotlight”. At a time when the stories of the sexual abuse of children by Catholic clergy were hidden in a shroud of secrecy, Garabedean’s work was essential in bringing those events to the light of day. According to their website the firm has represented over a thousand victims and survivors of clergy sexual abuse and obtained settlements in 2002 for 10 million and in 2003 for 85 million on behalf of his clients (among others). From Mitchell Garabedean’s talk the audience heard a man deeply committed to bringing criminals to account in his civil capacity. He recounted the story of when he was a boy and had a farm stand, how a police officer came up to him and said essentially, “I’ll be willing to forget to ask you for your vendor’s license if you give me these items for free.” This was his introduction to how power can be abused. What is notable is that even though we know the outcome today, when Garabedean was fighting these early cases the outcome was not guaranteed, not by a long shot. And the economics of this system allows large entities with attorneys on retainer to have well-funded fights and they benefit from delays while tort lawyers most often work on a contingency basis which means the attorney does not receive income until a judgement at the end of a trial is paid. At great personal risk for his practice, Garabedean had to be willing to go bankrupt if that’s what it took and that determination carried the day. Jan Schlictmann knows all about fighting to the point of bankruptcy, which is indeed what happened to his practice in his fight for his clients in Woburn, Massachusetts against Beatrice Foods and WR Grace. Schlictmann uses humor and a self-deprecating wit to tell the tale of how his mother reacted to her son being portrayed by John Travolta in the movie “A Civil Action” which was based on the book that recounts the real life struggle for justice for his clients who were harmed by contaminated water. Schlictmann’s case had the additional burden of having to fund the scientific proofs required for the satisfaction of the court. It was through the efforts in this court case that led eventually to the EPA filing their own lawsuit against the same companies for contaminating the water and Beatrice Foods was forced to pay 65million for cleanup costs. Schlictmann recounts that with many tort cases, the actual fight in court is the last resort, not the first. For Schlictmann, sometimes the best forum to address a harm is in mediation where parties can meet in good faith with all of the evidence on the table so that accountability and resolution can be achieved. But it is the leverage of litigation and being willing to go the distance if the situation demands that is the position of power for the otherwise powerless. 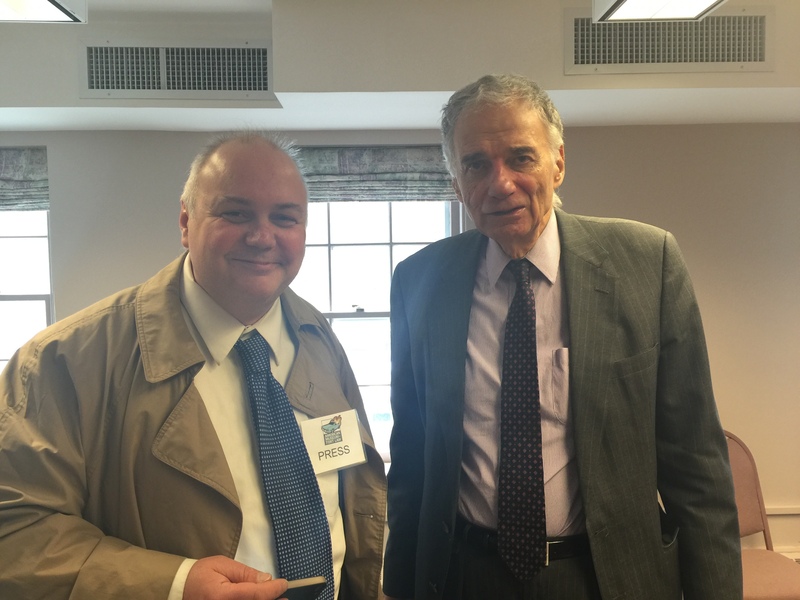 The last speaker was Ralph Nader, consumer advocate and founder of the American Museum of Tort Law. 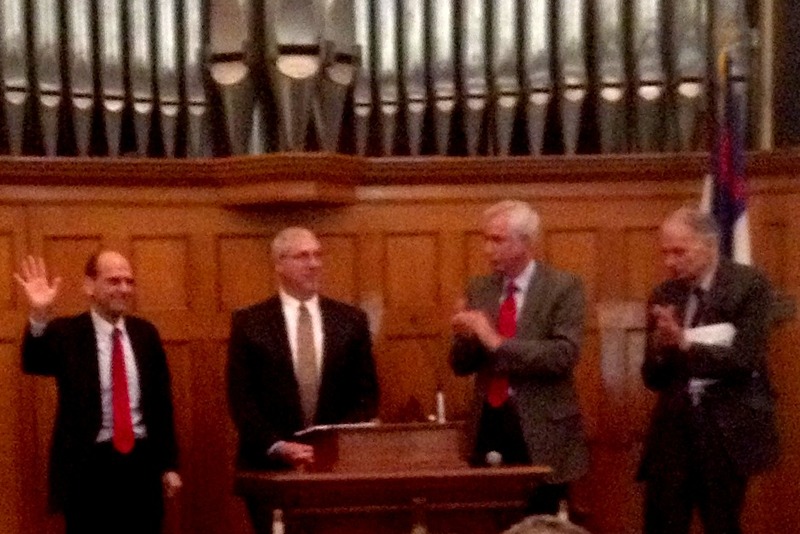 When Richard Newman began to introduce Ralph Nader, he merely began by saying his name to which the audience cheered in such thunderous applause that after a minute, Newman withheld his prepared introduction and simply turned the podium over to Winsted’s favorite son. Each discussion Nader provides enjoys a clarity of vision and purpose. Resolute in his belief in the power of individuals to do extraordinary things. 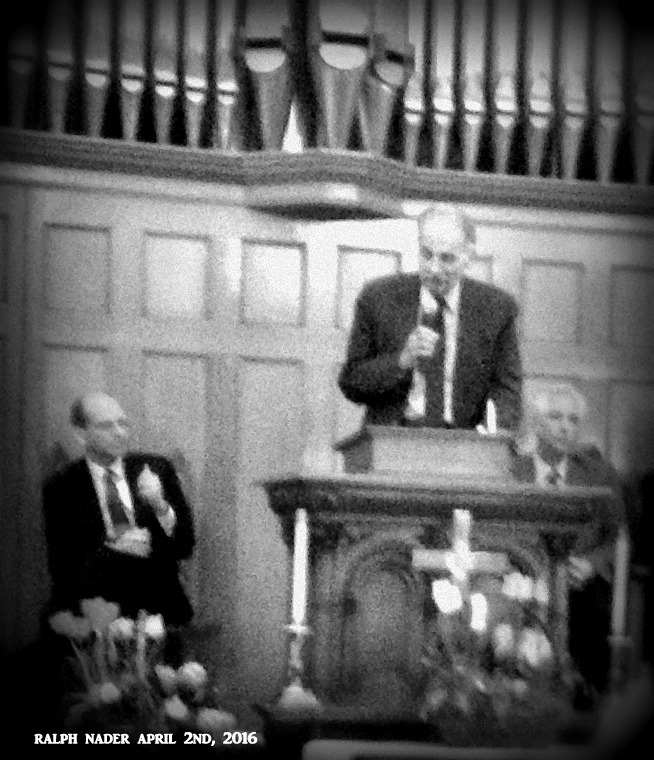 Nader shared the story of some of the first acts of defiance before the American Revolution. When King George III required all justices of the court in Massachusetts to have fealty to the crown as they would be appointed by the Governor (who was appointed by the King), farmers in the rural regions of Massachusetts got together. Before email, before facebook events, before the phone or any other means of electronic mass communication, farmers joined forces and forced the newly appointed judges to publicly recant or rescind their appointments or short of that, to leave for the protection from the red coats in Boston. This event exemplifies the fundamental concept that individuals who band together for a common purpose can make a monumental difference in society. At the end of Mr. Nader’s discussion there was a “Q & A” session with the audience which was informative and enlightening. Tort Law is fundamental to the founding principles of freedom in our country. Not to put too fine a point on it but the executive and legislative branches of government are often beholden to the moneyed interests who financially backed the campaigns of those in elected office but in tort law, every citizen has the right and legal standing to depose those in the highest positions of corporate or government power if the situation is deemed necessary and worthy in a court of law. Nader shares that there has been a systematic and persistent effort to diminish these important rights but as a society we must educate ourselves on these rights and use these rights. The American Museum of Tort Law is a beacon for this fundamental American right to redress the wrongful injuries caused often by powerful and resource rich forces. It is a museum that seeks to educate about tort law and it does so in a visually appealing and user friendly way. Within the museum are exhibits including a Corvair, a vehicle that had serious design flaws which Nader was able to document in his book “Unsafe at Any Speed”. There’s an exhibit on dangerous toys, an interactive display on certain famous tort cases and the entire museum has artwork and illustrations depicting the cases in engaging fashion (so much so that I’ll write a separate piece just about the artwork alone.). For more information about the Tort Museum visit their website: TORTMUSEUM.ORG Their hours from April 1-December 31 is Wednesday – Monday, 10:30 a.m. – 5:00 p.m. (Closed Tuesdays). Check back to Nutmeg Chatter as we’ll have more stories about this museum shared in different and interesting ways. There will be a Black Tie Lunchbox video segment and a Crayon Diary and MORE! Check this space!